Why would I choose an automatic/electronic pipettor over a manual pipettor? Comfort: offers a reduction in hand strain, especially when doing repetitive pipetting. Repeatability: automatic pipettors can increase accuracy for inexperienced users. Consistency: automation can increase the coefficient of variation. Personal Preference: Generally, the choice between automatic vs. manual pipetting is heavily dependent on the user’s preferences and application. Are pipette tips universal, or do certain brands only fit certain pipettors? 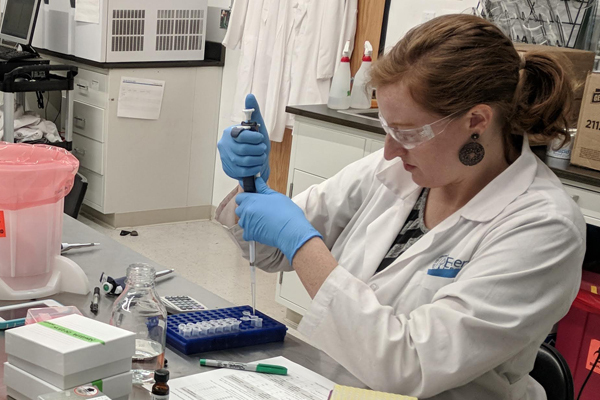 5mL and 10mL pipette tips do not have a general standard, so these sizes typically only fit pipettors made by the same manufacturer, or a small subset of manufacturers. We always recommend using pipettors and tips from the same manufacturer. This will give you the best tip fit and accuracy because the parts were specifically designed to fit together as a system. When would I use a multi-channel pipettor? Typically, a multi-channel pipettor is used anytime a microplate is involved. If the user is filling a 96-well plate, a 384-well plate, etc. it will be easier and more efficient to do so with an 8 or 12 channel pipettor. A single channel pipettor is used for most other functions. What are the wetted parts (which materials touch the fluid being pipetted)? There is no pipettor where the liquid should enter the pipettor body; it should always be contained within the tip, regardless of style. This means there are very few wetted parts. Most standard pipettors are “air displacement pipettors,” which are commonly used for multiple applications on a daily basis. 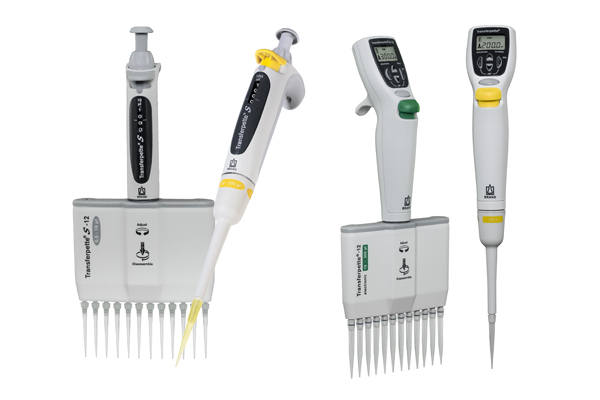 Repeating pipettors that use syringe-like tips (such as the BrandTech® HandyStep S & HandyStep Electronic), typically use positive displacement pipette tips. BrandTech PD Tips feature a wiping seal piston that moves inside of the tip in order to push the liquid out. Typically, if the liquid is viscous or volatile you might choose a positive displacement pipettor; otherwise the most commonly used pipettor would be the air displacement style. In an air displacement pipettor (such as the Transferpette-S, electronic, etc.) there are no wetted parts within the pipettor. The liquid will ONLY come into contact with the tip. How does ergonomics play a role when choosing a pipettor? Ergonomics is everything! 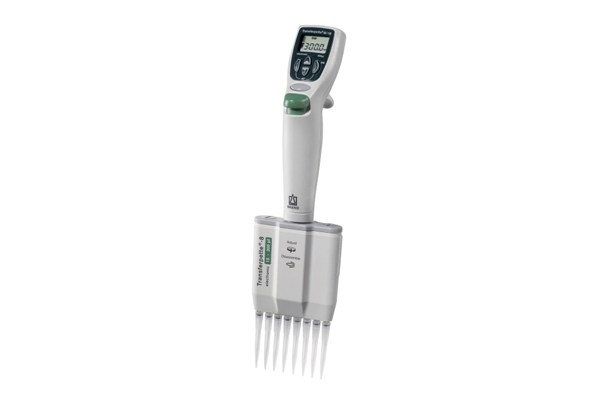 Many customers are using the pipettors all day long. To prevent a repetitive strain injury, it is crucial that a pipettor be ergonomic and easy to use, fit naturally in the hand, etc. All BrandTech products are designed with ergonomics in mind. When selecting a pipettor and looking at the different brands there are quite a few factors involved. First, the model (electronic, manual, single channel, multi, etc.) is going to depend heavily on the application and what the user’s preferences are. Pipettors are manufactured in numerous places. It is imperative, when selecting a pipettor, or any other piece of equipment for that matter, that you look closely at where the product is coming from and what type of facility is it. All BrandTech pipettor products are manufactured in Germany, and are made with the highest quality raw materials. Each brand is going to have slightly different features. Depending on your application and/or personal preferences you should choose the pipettor that has features that will be most useful to you. Typically, you will get what you pay for with pipettors. High-quality pipettors are generally manufactured in Germany while cheaper, lower-quality tend to be sourced from China or India. Depending on how you prioritize dependability vs. cost, you might choose a higher or lower-end pipettor. We pride ourselves on our technical support, and the ability to help our customer’s select the appropriate tools to get their work done. If you have more questions or need further assistance selecting a product please reach out to us via email (info@cplabsafety.com), online chat or phone: 1 (888) 322-5722.